So, with the relaunch issue up and out, the real trick is following that up. So here's June. 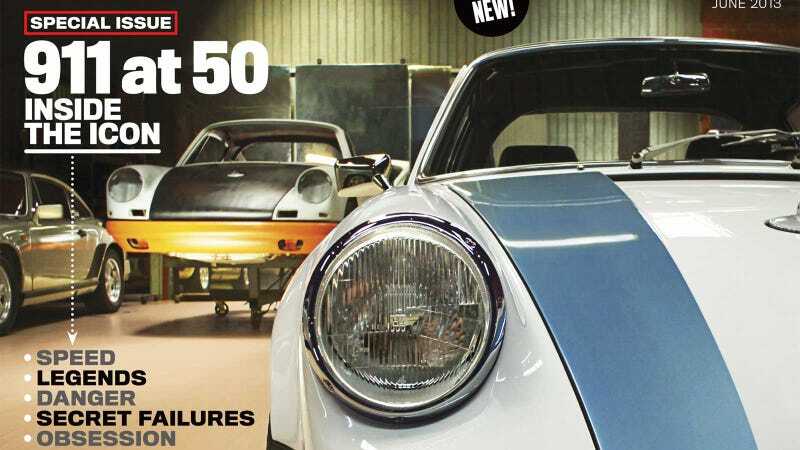 The 50th Anniversary of the Porsche 911 takes center stage, with Magnus Walker's shop featured on the cover. Some of the stuff to look forward to: Chris Harris on the Singer 911, a photo spread on Porsche's secret hoard stashed in a German warehouse, Sam Smith driving a 934 and a 935, Peter Schutz on the day he walked into Helmuth Bott's office and saved the Porsche 911, and plenty more. At this spring’s Geneva motor show, there were crowds fighting to snap pictures of the newest fast cars from Ferrari, Lamborghini, and McLaren. Over at the Porsche stand, a drop-dead gorgeous 911 GT3 sat in relative solitude, receiving only passing, disapproving glances. The proverbial pitchfork-wielding Porsche purists weren’t pissed just because the new car no longer uses the Le Mans-winning Mezger engine found in all previous GT3s. No, the nail in the newest Porsche’s coffin of public opinion was that it will be available only with an automatic transmission. Which is, by the way, no different from the crowd-pleasers over at Ferrari, Lamborghini, and McLaren. So, how is the PDK-only GT3? Here's the full story.